Bill Bither, co-founder of Machine Metrics, on the shop floor at Valley Steel Stamp in Greenfield. And that short, simple phrase has become a huge part of the lexicon at Valley Steel Stamp (VSS) in Greenfield — and with good reason. To explain why, Rico Traversa, the company’s operating manager and a manufacturing engineer, took BusinessWest to the so-called war room, what those at this rapidly growing precision manufacturer of parts for the aerospace industry, major arms makers, and other customer groups call the operations center, located just off the shop floor. 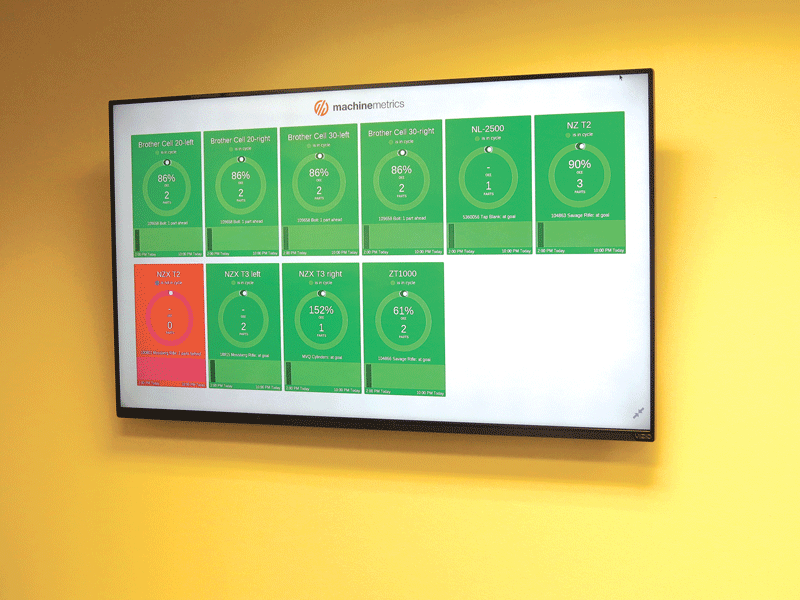 There, on one wall, are two large, digital display boards, or dashboards, as they’re called, an integral part of a performance-monitoring system created and installed by Northampton-based MachineMetrics. One dashboard shows 11 circular graphs, or rings, that essentially chart the execution of each machine tied into the system and each production shift — in real time. It is 2:05 p.m., so the second shift has just started, and therefore all but one of the rings are green, meaning the machines are operating at or above the desired performance levels. One is orange, which means it is operating slightly below that level. If one should happen to turn red, it means what that color usually means — trouble. But because of the dashboards and other elements of this system, that trouble can be identified, and dealt with, much sooner and more effectively than previously possible, said Steve Capshaw, president of VSS, who spoke about Machine Metrics with an enthusiasm that was clearly evident. “This is an absolute game changer for us,” he said, adding quickly that it could also be considered one for the precision-manufacturing industry as well, a sector that has for years been starving not only for big data, but, more importantly, a way to effectively digest it. Capshaw said the MachineMetrics system has yielded a roughly 20% increase in efficiency since it was implemented about a year ago, a huge number in this industry. When asked to qualify and quantify what that meant, he said this improvement will not only accelerate the company’s already-ambitious growth projections — Capshaw said VSS has tripled in size, from $3 million to $10 million over the past five years, and expects to reach $20 million in another five years — but enable it to navigate this industry’s most pressing, and perplexing, problem, a deep talent shortage, far more effectively. This simple arithmetic means that Bill Bither, Eric Fogg, and others involved with MachineMetrics seemingly have the right product at absolutely the right time. Eric Fogg says the MachineMetrics system analyzes performance in real time and sends alerts to clients when production falls behind. 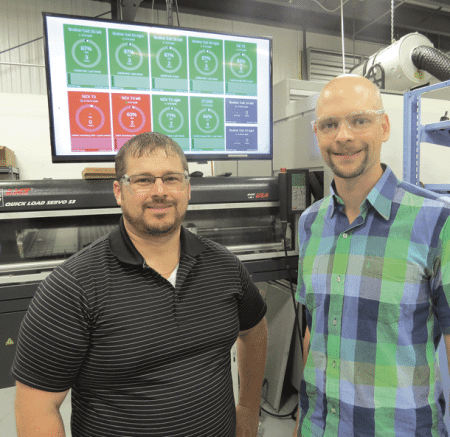 A trio of partners — Bither, Fogg, and Jacob Lauzier — came together on the concept roughly two years ago in an effort to capitalize on emerging technology that has essentially created a language that allows shop operators to read how their machines are functioning. And they have brought that concept to a critical stage in its development. Indeed, with successful stories being scripted at VSS and a handful of other clients, the company is poised to greatly expand its customer base and geographic reach. 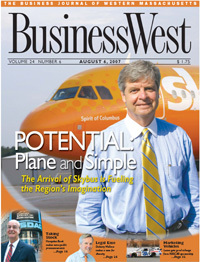 Fogg, whose business card declares that he is vice president and “chief evangelist” of this venture, was readying for a trip to Colorado when he spoke with BusinessWest, and was expecting to advance and perhaps close a significant deal. Bither said the company recently closed on a round of venture-capital funding that exceeded $1 million. That infusion will be used to help scale up the venture and “prove out the sales model,” thus broadening the company’s customer portfolio to manufacturers of all sizes. “Right now, it’s about product development and making sure we have the capability of selling this to many types of manufacturers that have different types of needs,” he said, adding that, while the company has shown it can serve a relatively small shop like VSS, it must shape the model to accommodate corporations with billions in sales and thousands of machines. As he talked about the MachineMetrics product, Capshaw noted that the precision-machining industry generally runs at least five years behind other sectors when it comes to advances in IT and, especially, the interpretation of big data. That’s primarily because the equipment being used on shop floors today is quite complex, and IT is generally applied to those machines long after they are up and running. What was needed, he went on, was a standard language by which the controls of machine tools could export common information for which applications could be written. The machine-tool industry eventually came together to create that language, called MTConnect, said Capshaw, adding that what has followed could best be described as attempts to harness that language. Overall, advances have come slowly and marginally — until MachineMetrics. “Five years ago, we went to the International Machine Tool Show in Chicago, a huge show that comes every two years, and looked at machine-monitoring software,” he explained. “There was basically one company there that did it; they didn’t use the MTConnect standard, and the system was clunky. It’s like, if you were looking for a computer today, you knew what you wanted, you went to a store, and all they had was a Commodore 64 or Apple IIe. “So we decided to wait a few years,” he said, adding that the next Machine Tool Show featured perhaps 20 vendors with monitoring software, with most of the products still lacking in one or more ways. Machine Metrics wasn’t one of those companies, because it hadn’t yet been incorporated, but the seeds were being sown for a system that could potentially change the landscape. The principals would bring to the table experience in entrepreneurship, software development, problem solving, and precision machining. Indeed, by that time, both Bither and Fogg could already be considered serial entrepreneurs. 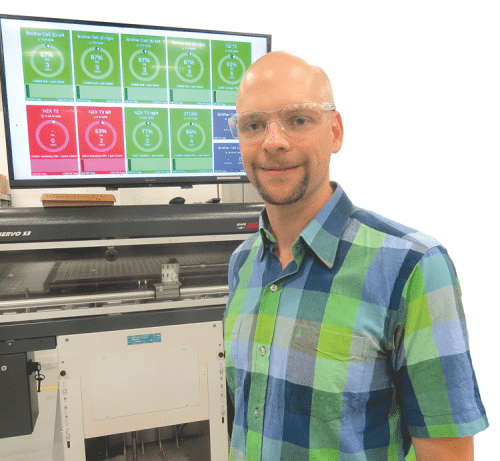 Bither, a member of BusinessWest’s first 40 Under 40 class in 2007, founded the enterprise software company Atalasoft, which he later sold to Kofax, now Lexmark. Prior to that entrepreneurial episode, he worked in aerospace engineering — he was a design engineer at Hamilton Sundstrand for several years — and knew Capshaw from his work in that field. Fogg, meanwhile, began his career in a machine shop in his hometown of Brattleboro, Vt. He started out packing boxes and washing parts, and eventually worked his way up to programmer. He later started his own machine shop, Greentech Engineering, in Holyoke, which, as that name suggests, specialized in the engineering and prototyping of green-technology products, including mounts for solar panels and prototype wind turbines. To make ends meet, he took on some aerospace work at night, he said, adding that the recession that started in 2008 put a rather large dent in both aspects of his business, prompting a shift into consulting work that focused on his strengths in precision manufacturing and ‘green’ product development. 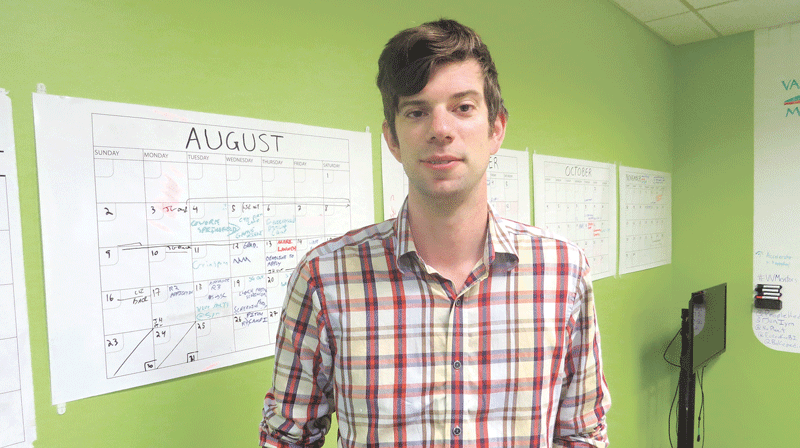 Fogg said he met Bither at a Valley Venture Mentors meeting soon after he sold Altalasoft, and the two began looking at challenges they could undertake together. Their knowledge of the precision-machining field made them keenly aware that there would be a huge opportunity awaiting those who could develop software that could effectively monitor and record the performance of machines and people, and they set out to create it. Rico Traversa, operating manager at Valley Steel Stamp (left), and MachineMetrics co-founder Bill Bither stand near one of the dashboards on the VSS shop floor. Soon after founding MachineMetrics, they brought on a third partner, Jacob Lauzier, the company’s chief technology officer, who brings to that post a background as a user-interface designer and web-application developer. Together, they brought MachineMetrics to the market using VSS as a pilot company — one that has seen results far exceed expectations. As he discussed what the MachineMetrics product means to manufacturers, Fogg related what sounded like a not-so-hypothetical situation involving that machine shop he worked for years ago. Machine Metrics was designed to make such discussions a thing of the past, said Fogg, adding that the software can not only pinpoint what what wrong, when, and where, but it can alert supervisors to potential problems before they happen and keep shop owners from having to make phone calls like the one mentioned above. Effective retrieval and analysis of that data has enabled VSS to improve what’s known as OEE (overall equipment effectiveness) from around 70% to roughly 90%. While visiting the war room at VSS, Bither explained just how the software works. The system tracks performance in real time, said Traversa, adding that this represents a vast improvement over the conditions that existed before the software was installed. 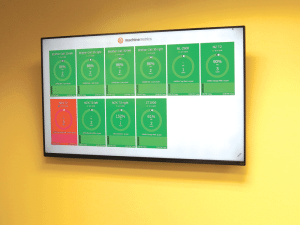 The MachineMetrics system has made the phrase ‘being in the green’ — as most all of the machines at the company are at this moment in time — part of the lexicon at VSS. Capshaw, who spoke with BusinessWest by phone while vacationing on the Cape, said the system allows him to see what’s happening at the shop on a host of devices. He noted that productivity at VSS has increased 10% not from really doing anything with the data specifically, but simply from having it and making sure employees know they have it. Employees simply have to look up at the dashboards on the shop floor to track how the machines they’re assigned to are performing, he went on, adding that no one wants to see the color red appear, and everyone wants to stay firmly in the green. Roughly another 10% improvement has come from going back over data, identifying issues, streamlining production, and improving maintenance, he went on. Thus, benefits come in a number of forms, he said, listing everything from enhanced productivity to improved morale, especially among third-shifters, who seemingly toiled in anonymity. Perhaps the biggest benefit, though, is some reduction in stress when it comes to the nagging issue of finding enough talent as a result of that improved efficiency. Moving forward, the obvious goal for the principals at MachineMetrics is to scale up their venture, and the recent infusion of capital will be used for the many aspects of that assignment. Fogg said one of the company’s major challenges, not unlike the one confronting its customers, is finding talent. Overall, the potential for growth is immense, said Bither, adding that the market for performance-monitoring software in the precision-manufacturing sector will reach into the billions of dollars. Just how big that number will get, he doesn’t know, but he does know Machine Metrics should be well-positioned to seize considerable market share. “There are a few competitors, but this is fairly new technology, so there isn’t one company that’s out there dominating,” he explained, adding that a company in Germany and another based in Silicon Valley are gaining some traction in the industry, while others are struggling in their attempts to do so. As mentioned earlier, this is now an informal mission statement and both a spoken and unspoken rallying cry at Valley Steel Stamp. Just how prevalent that phraseology becomes in this industry remains to be seen, but from all accounts, MachineMetrics seems poised to turn out some solid growth patterns of its own. And it also appears destined to be part of the wave of entrepreneurial energy sweeping over the region.